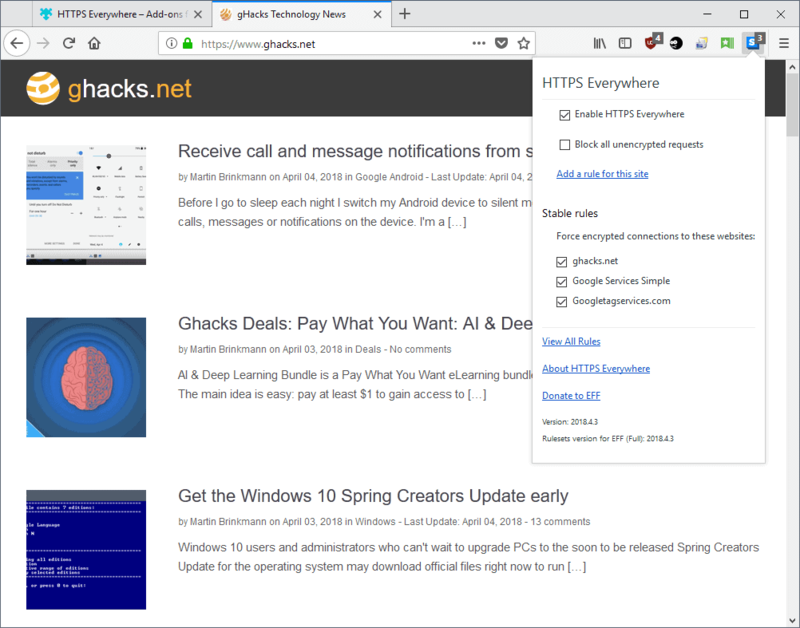 A new version of the HTTPS Everywhere browser extension introduces a new feature that separates ruleset updates from extension updates. HTTPS Everywhere is a security extension that is available for Firefox, Chrome, Opera and the Tor Browser. The extension enforces HTTPS connections on sites that support it to improve security and privacy. We reviewed the first version of the extension released in 2010, and have followed it ever since. Once installed, it checks whether any site the browser connects to is on the extension's ruleset file. If it is, HTTPS is enforced for the site. The current version of HTTPS Everywhere includes a set of more than 23,000 rules for sites that support HTTPS. Previously, the Electronic Frontier Foundation, makers of HTTPS Everywhere, had to release a new version of the extension whenever it wanted to distribute a new ruleset file. Even if the extension itself did not change at all, it had to be updated to distribute the new ruleset to all installations. The process was impracticable for a number of reasons: a new version has to be created and uploaded to extension stores, extensions have to pass validation, and updates reach users only if they have not disabled extension updates. The new system separates extension updates from ruleset updates similarly to how content blocker handle updating content blocking lists. HTTPS Everywhere checks for ruleset updates periodically and downloads them if updates are available. Rulesets are signed by the EFF and verified using the Web Crypto API to make sure that they are legitimate before they are updated in the browser. Users and administrators may disable the automatic updating of rulesets in the extension settings. Firefox users, for example, open about:addons in the browser, click on the options button next to HTTPS Everywhere, and remove the checkmark from "Auto-update rulesets" to do so. The initial version of the feature transfers the entire ruleset file to the browser when updates happen. The EFF plans to improve the functionality so that only the changes between editions are transferred and not the entire ruleset file. The new HTTPS Everywhere 2018.4.3 is available for download on all supported extension stores and as in-browser updates. Now You: Do you use HTTPS Everywhere? I’ve been using it ever since I can remember. But as I understand it, HTTPS Everywhere can’t convert a non-SSL site into a SSL. That’s probably why http://mozillazine.org/ remains unencrypted while https://mozillazine-fr.org/ is encrypted. I assume they’re both the same since they use the same logo banner at the top of their respective sites. Odd that they should use the same banner ID at the top of the page then. I for one Hope that it is really true, would be so great!! Is there any point in having this extension, considering that sites which have https let your browser connect as such? Sites that only have http cannot be forced by HTTPS Everywhere. Yes, because a site being accessible via HTTPS does not mean that it establishes the connection that way by default. Klaas, some sites support HTTP and HTTPS, for instance while they are in the process of migrating to HTTPS exclusivity. OK Martin, thanks, HTTPS Everywhere then makes sense. I have reinstalled it. I see that you too use uBlock origin. I was wondering if I need to install ‘WebRTC’ addon? Cuz, uBlock origin already has an option of blocking webrtc… let me know, please. :) Thank you. There’s no point, unless the webmaster allows visitor to access the site via HTTP too. Don’t believe in me because of what? The first paragraph of the article on the wiki states exactly what I said, it’s only worded differently. Not worth the resources it uses IMO, at least not here in the “Wild West”. Maybe in eastern Europe or Asia, I don’t know how prevalent the use of HTTPS is there. On AMO, looks to me like one quarter of one percent of all FF users are using HTTPS Everywhere. I would call that a niche product, just saying. IMO HTTPS Everywhere is one of those add ons that made sense back in the early days of HTTPS nowadays however it is irelevant and offer little if any – false sense- of security & privacy, additionally it’s quite heavy on resources, not to mention that i’ve seen plenty of malware ridden sites with HTTPS encryption. HTTPS Everywhere is no longer compatible with out-of-the-box Pale Moon, and its Pale Moon fork, Encrypted Web, is abandoned and not supported on Pale Moon 27+. You can supposedly install HTTPS Everywhere using the Moon Tester Tool … but the caveat that installing stuff that way might break your browser isn’t exactly encouraging. I’ll have to think about it … and I’ll definitely back up my profile before trying.